It has been over thirty years since Harriet Fish Backus wrote Tomboy Bride. 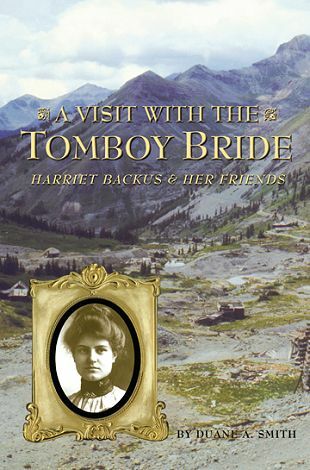 Those that have read this regional classic about the trials and tribulations of a new bride at the Tomboy Mine, high above Telluride, Colorado, are passionate in their praise for it. Since the author died over twenty-five years ago it was presumed that there would never be a sequel. Fortunately for us, Fort Lewis College professor, Duane Smith, did an early review of Tomboy Bride in Montana: The Magazine for Western History in the 1970 summer issue. Harriet enjoyed the review, wrote Duane Smith, and began a correspondence with him that would last until her death in 1977 at the age of ninety-two. Over the years she sent him photographs, letters from her friends who had lived in Tomboy Basin, and most importantly she recounted additional tales (such as the trials of a new mother trying to breastfeed a baby at that altitude) that she had not put in the book. She also wrote about how she came to write the book and the obstacles she encountered in getting it published (the first edition was a self-published book). Professor Smith’s book is not meant to replace Tomboy Bride, but rather to supplement it with a potpourri of information and photographs from Harriet and her friends, as well as observations from Duane Smith. A Visit With the Tomboy Bride takes us back again to another era and allows us to relive the adventurous life of a new bride thrust into an unfamiliar lifestyle. We can once more experience the grace with which she accepts her hardships and the love and commitment that she shares with her new husband and eventually her newborn child. Just as the original, this book reflects a wonderful, spirited life high above timberline in the rugged San Juan Mountains of Southwestern Colorado. If you enjoyed Tomboy Bride you will want to read the rest of the story in A Visit With the Tomboy Bride.